I’ve been wanting to come here for years because of the cute cartoon drawings on the storefront and their Beatles-inspired (possibly unintentional) name. Our friend, Ikai, raves about this place because their sandwiches are huge and they make a mean Spicy Italian sub. There are so many delicious deli sandwiches around the city, I had to put Yellow Submarine to the test. Verdict? A little underwhelmed. To sum it up, there was too much bread and not enough meet. The front of the restaurant advertises “Boston-style sub.” What is a Boston-style sub, you might ask? Well according to another review, it’s Boston-style because 1) the owner is from Boston and 2) they don’t offer everything with a meatball sub. You first enter this tiny, and I mean TINY, cramped space to order your sandwich. 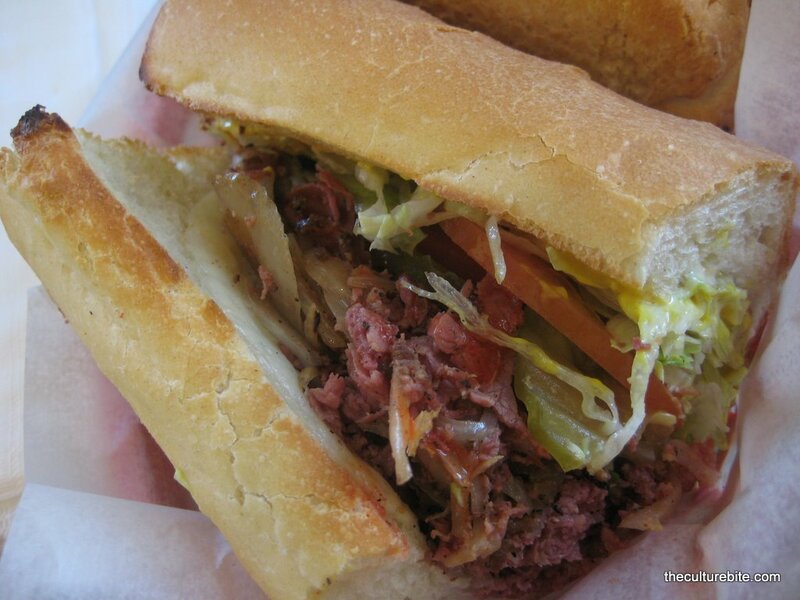 The menu is what you would see at any other sub restaurant – pastrami, roast beef, corned beef, turkey, ect. After you place your order, you can then walk into their sitting area and await patiently for your number to be called. Towards the back wall of the sitting area is a neat wall painting of what I assume to be their old menu. Back then you could’ve had a large Italian Combo for only $2.35! The sandwiches are lightly toasted so that the bread is still pillowy-soft. What I appreciate about the toasted bread is that they only toast the inside. One pet peeve I have about sub joints is hard bread that can cut up the roof of my mouth. Corned Beef Sandwich – Like I mentioned earlier, the proportion of bread to meat was way off. The real plus about the restaurant is the bottle of homemade hot sauce sitting on the table. I love my hot sauce, so I doused it all over my sub.